Calling all hockey fans! If celebrating your favorite sport on your birthday is your goal, these hockey-themed party ideas are sure to score big with guests! When it comes to sports parties, a ticket-style invitation can make guests feel like they are receiving exclusive admission an exciting event. Printable ticket invitations can be personalized to suit the occasion with your images and text. If you have a lot of information to share that won’t fit on a ticket, however, you may want to go with a store-bought, card-style invitation or flyer made from your home computer. Another fun idea is to take a picture of the birthday child in a hockey uniform and use that image to create a postcard-style invite. If you’re having the party at a hockey rink or on a field, you won’t need to bring many decorations since the venue already provides an atmosphere to suit the theme. To personalize your party. However, you can set the food table with paper goods in the colors of your child’s favorite hockey team and maybe hang a few matching pennants and balloons around the party space. Use a white tablecloth and red and blue tape to make your hockey rink tablecloth. Hang hockey jerseys on the walls, or place them over the backs of your dining chairs. Hockey sticks cab be propped in corners or hung over archways. Make cardstock cut-outs of hockey sticks, pucks, skates, and jerseys. Hang these on walls, use ribbon to dangle them from the ceiling or use them as place markers and food labels on your dining table. Hockey trading cards can be hung around the room and scattered on table tops. Hockey stick cupcakes: top white frosted cupcakes with pretzel sticks shaped to look like hockey sticks and a small, round, black cookie to look like a puck. Traditional concession stand menu items such as pizza, hot dogs, popcorn, soft pretzels, and nachos. At the rink or in the backyard, a game of hockey seems to be the obvious activity of choice for this party theme. 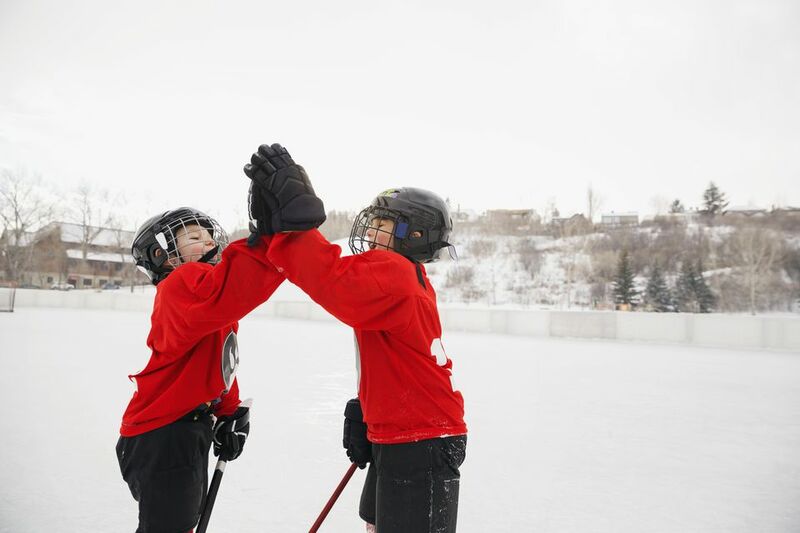 If you don’t have space or equipment needed to do this, however, kids can play some of these fun hockey-themed party games instead. Make your hockey sticks: Kids can use folded the newspaper and colored masking tape to shape, tape and design their hockey sticks. Another idea is to cut the shapes of hockey sticks from cardboard and give party guests a supply of craft items with which to decorate their sticks. Hockey-themed face painting and temporary tattoos. Pin the Puck on the Ice: Draw a goal on a piece of white poster board and hang it on a wall. Give kids a puck cut from card-stock paper. Blindfold players and see who can pin the puck the closest to the goal. Favor ideas can range from something like a personalized jersey for each guest to a bag of chocolate cookies, labeled as hockey pucks. Small bottles of sports drinks.